Garam masala is a blend of ground spices common in North Indian and other South Asian cuisines. It is used alone or with other seasonings. 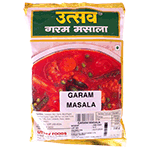 The word garam refers to intensity of the spices rather than capsaicin content. Very hot! Product of India.